Ground floor. Preferred parking. Walk to all base amenities. 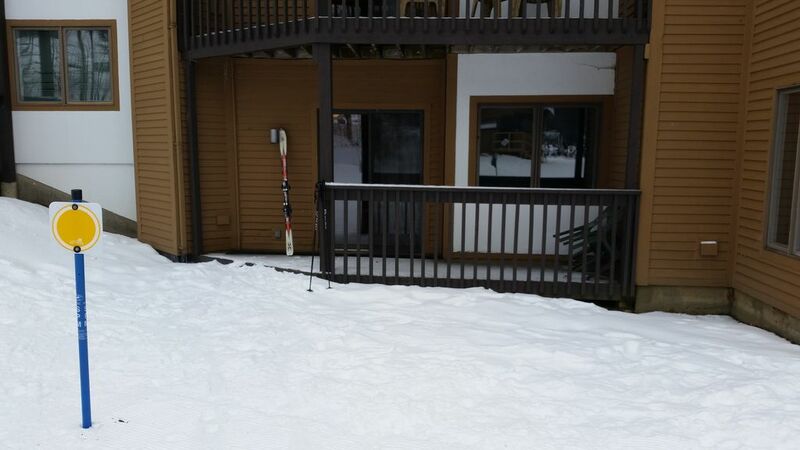 1 Bedroom ski in ski out, ground floor unit. Parking at unit. On ski trail. Wood burning fireplace. King Sized Bed in separate bedroom. Queen Sleeper Couch in Living Room. Sleeps up to four. Full kitchen, stove, microwave, frig, dishwasher, coffee maker, coffee grinder, toaster oven. Okemo Mountain Lodge C Building. Walk to all Clock Tower Base Area amenities. Free Wifi. Great mountain views. I am an avid skier and love Okemo. My family uses the unit as well. It is perfect for my son who is learning to ski because the ski school slope is right in front of the unit. I am in hotel business so I understand hospitality that is why the unit is professionally cleaned before your stay. We love Okemo and you can't beat ski in ski out. You can be at the lift in 10 seconds in the morning. Stop by the unit for lunch or breaks. It is just perfect. It is all about the skiing and riding but there is also an indoor pool, spa, and workout facility at Okemo (additional day fee). In the summer there is Mounatin Biking accesses by the lift. Timber Ripper roller coaster, zip line tours, golf, mini golf, Frisbee golf, stunt jump, tramboline, and segway tours. Always hiking and antiquing. 2 flat screen smart TV's with Netflix, Amazon Prime etc. Mountain Bike Rentals and lift access right out your door in summer. There is Mountain Bike park right out the front door. Could not possibly be more convenient ! We absolutely loved the location and convenience to literally everything. The ability to step outside the sliders and be on the slope was awesome. In addition, short walk to the lift, the lodge and The Loft was great. We also loved that this building is situated just far enough away to provide quiet and privacy. The parking was another added bonus; pulled right up to the building and didn't have to "lug" our stuff across parking lots/up & down stairs, etc (been there, done that!) Also enjoyed the wood-burning fireplace (a must for us when in VT!) Will stay here again on our next visit without hesitation. Dave was great, perfect communication. Arrived and somehow fireplace glass had broken. He had it fixed immediately and unobtrusively. Location really is amazing, you could ski right into the living room (we didn't). Basic accommodations, but everything you need in the kitchen and lots of towels and bedding. Will stay again. Fantastic host. Great, amazing location. Will repeat. We loved our short stay at Dave's slopeside retreat. Everything was just as advertised and great value for money! It's about a 4 foot walk from the deck to the slope that brings one down (about 30 yards) to the quad lifts. And Dave has figured out everything necessary to help maximize slope time and enjoyment. The buildings are a bit utilitarian but Dave's is very comfortable, well appointed and cozy. We'll be back for sure! Exactly as advertised; exactly what we wanted! Property is just as advertised, and Dave is great to work with! Simple, clean, well thought out one bedroom condo three steps from groomed snow to the Quad lifts. And ski back to that same spot without slowing or poling. If you quit early like we do you can sit outside on your deck in the sun watching the kids finish the day. The building won't inspire visions of Beaver Creek or Deer Valley, but Dave's unit has very comfortable furniture and everything you need to maximize enjoyment of the slopes and Okemo facilities. Great value for money; we'll be back! Ski in Ski Out at base of Okemo. Best Slopeside location. Great reviews. Preferred parking.